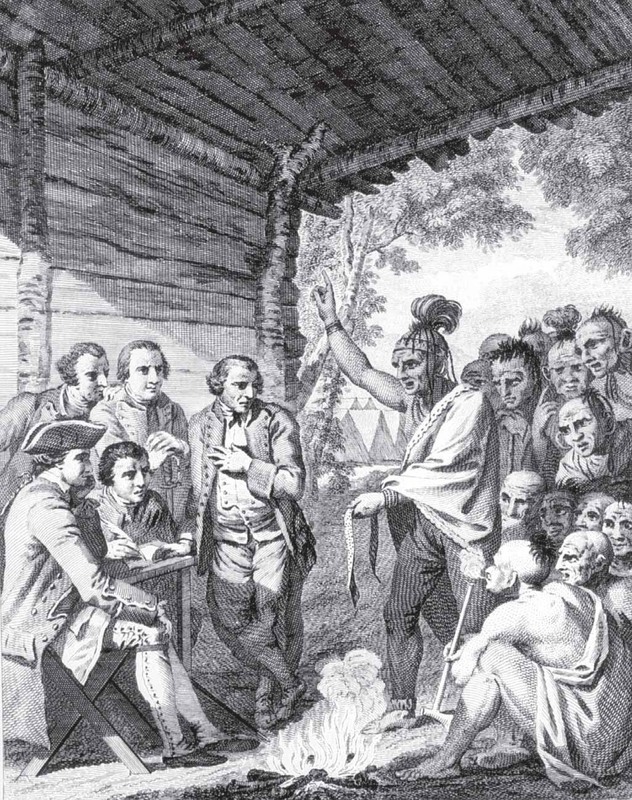 Delegate of the Shawnee negotiating the return of English hostages and peace in October of 1764, illustration of engraving by Charles Grignion, 1766, courtesy of Beinecke Rare Book and Manuscript Library, Yale University Library. The primary goal of European expansion and colonization was to acquire land and resources to produce exports to sell for profit on the growing trans-Atlantic market. Profitable production demanded significant labor resources. The elite and entrepreneurial western Europeans who settled in the Americas sought laborers to cultivate cash crops, mine for precious metals, tend livestock, provide domestic service, and work in various artisanal trades. The labor sources they drew from to fill this demand included European indentured servants and convicts, free and enslaved indigenous people in the Americas, and enslaved Africans purchased through the developing trans-Atlantic slave trade. This meant that early colonial labor forces in the Americas were often a mix of Europeans, American Indians, and Africans. In large plantation areas, however, enslaved Africans and their African American offspring increasingly became the dominant laboring population. This section outlines how various historic factors led to African slavery taking a central role in supplying labor and skills to develop New World plantations and economies. Indigenous populations, cultures, and societies in the Americas varied greatly across the Western Hemisphere at the time of European contact and colonial expansion. These regional variations influenced the types of encounters different European groups had with Native Americans. In Mesoamerica and the central Andes, for example, the highly centralized and hierarchical nature of indigenous societies facilitated their incorporation into the Spanish empire after conquistadors defeated local rulers and replaced them at the top of socio-political systems. 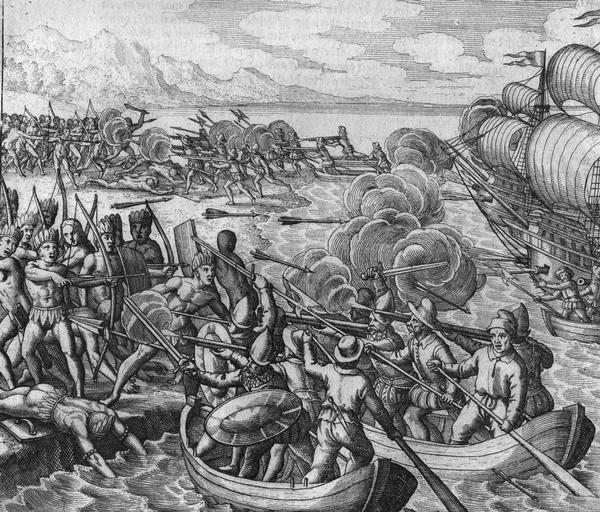 Amerigo Vespucci leads an attack on Amerindians on the island of "Ity" (location uncertain, possibly Bermuda), on his first journey to the New World in 1497, engraving by Theodor de Bry, ca. 1592. In New Spain, colonial authorities relied on the pre-existing native practices and networks to exercise power over local populations. In contrast, Europeans struggled to subjugate Native Americans living in more decentralized societies. In northern Mexico, the Chichimecas resisted Spanish conquest longer than their Aztec neighbors because their nomadic lifestyle and fluid leadership structures made them difficult targets to subdue. Europeans who settled on the shores of North and South America faced similar challenges. In the seventeenth century, European colonists in New England and New France in North America, for example, interacted with American Indian nomads and farmers who lived in egalitarian communities headed by a leader or group of leaders. While Europeans often referred to these individuals as kings and captains, their power was often temporary and limited. Unlike monarchs in Western Europe, leaders in these indigenous communities ruled by persuasion rather than inheritance. In this context, Europeans acquired land either through complex negotiations or perpetual warfare with American Indians, until native groups could be dispersed or pacified. In areas such as Canada, where the fur trade was the dominant economic objective for the French, violent conflict between American Indians and European newcomers was often avoided to improve trade negotiations. In various cases, small numbers of Europeans initially negotiated with various American Indians, but once the European colonial population and resources increased, their expansion strategies shifted from negotiation to conflict. Indigenous Nahuas people suffering from smallpox from the conquest-era in Central Mexico, ca. 1585, drawing from Book XII of the Florentine Codex, held at the Laurentian Library. Throughout North and South America, epidemics also played a central role in determining the power dynamic between Europeans and American Indians. In contrast to Africans on the Atlantic Coast, who could prevent significant European expansion through both military strength and stronger resistance to tropical diseases, American Indians totally lacked immunity to the infections and viruses Europeans brought with them to the New World. Fray Bartolomé de las Casas, painting by Felix Parra, 1875, courtesy of the Museo Nacional de Arte in Mexico City, Mexico. Bartolomé de las Casas (ca. 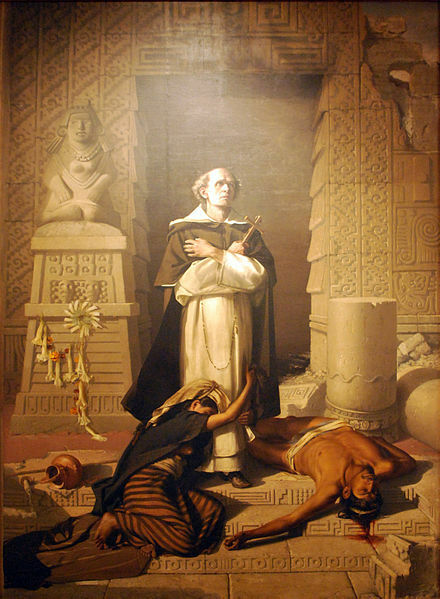 1484-1566) was a Dominican friar who was one of the first Spanish settlers in the Americas. He opposed the atrocities Europeans inflicted against American Indian groups, including slavery, and advocated to European leaders that Africans be enslaved instead of American Indians. This helped ingnite the trans-Atlantic slave trade to Iberian colonies. Later in life he redacted these views and saw all forms of slavery as wrong. Scholars estimate that millions of American Indians died or experienced weakened health due to rapid exposure to European diseases. In addition, Europeans brought new weaponry and horseback mobility for their military attacks, which also led to significant population loss amongst native groups throughout the Americas. Even when indigenous populations began to rebound from devastating epidemics, the weakening of their societal structures and military strength allowed Europeans to dominate or displace native groups from their traditional territories in the Americas. In the process of displacing indigenous groups, Europeans also attempted to enslave American Indians through military coercion and trade for captives from inter-Indian conflicts. In some areas of South America and Mexico, enslaved or coerced American Indians formed a significant part of the labor force. In North America, however, attempts to enslave American Indians on a large scale proved to be less successful. Though some American Indians did work for Europeans as free laborers, indigenous captives could escape more easily because of their familiarity with the local landscape and their ability to gain assistance from nearby kin (in contrast to enslaved Africans who were transplanted to a foreign landscape). In areas where Europeans needed to establish peaceful relations with American Indians for trading, or where European and indigenous settlements coexisted in close proximity, enslaving American Indians threatened to destabilize alliances. For example, the Yamassee War in the Carolina colony (1715-1717) partially resulted from disagreements over trade and misunderstandings between English colonists and American Indians over the nature of slavery. In addition, some European monarchs and religious leaders began to denounce enslaving American Indians, which further encouraged Euro American colonists to look to indentured European or enslaved African labor.